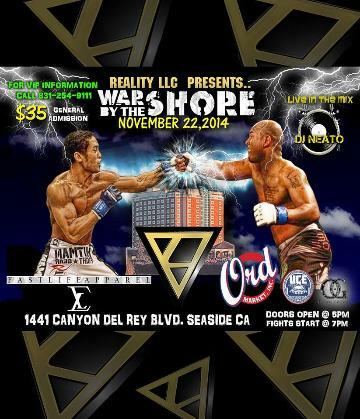 War By The Shore is the first sanctioned MMA Competition in The Monterey Peninsula Ever hosted by Reality LLc and CAMO! Come out to an exciting night of fights with DJ Neato live in the mix and speical guest performances. Also there will be food and beverages along with 2 fully stocked bars and discounted beers all night. we looked forward to seeing you at the fights at Embassy Suites Monterey Bay in Seaside, CA Saturday, November 22nd!